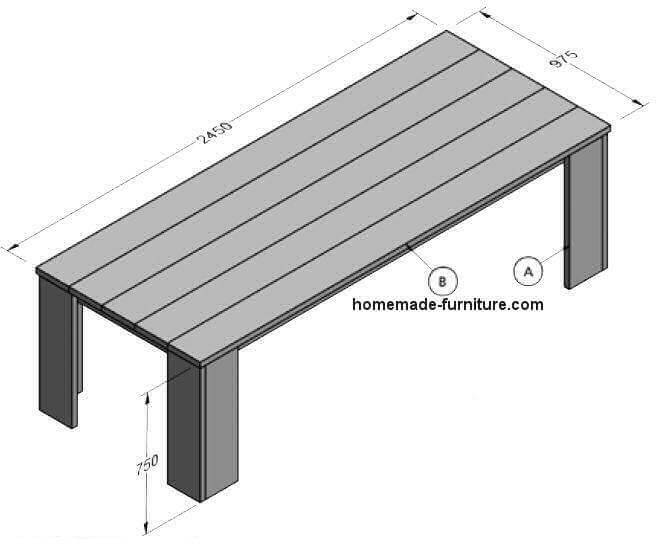 ﻿ Tables designs plans and drawings, free instructions how to make a table. 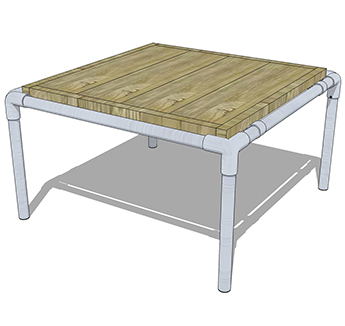 Free drawings and plans for homemade tables. 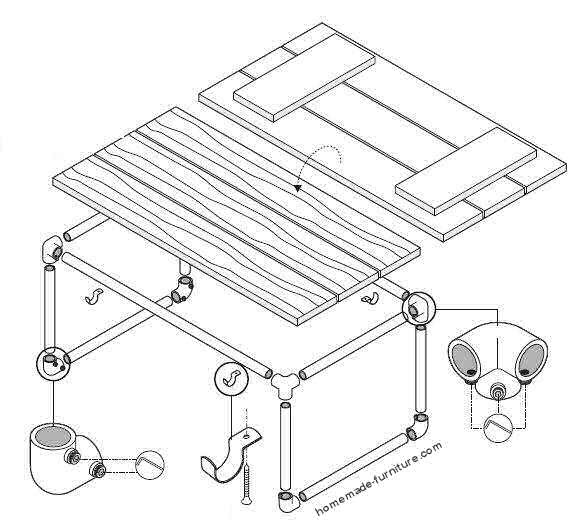 Instructions how to make a picnictable. Easy garden table plan for recycled panks and scaffolding wood. 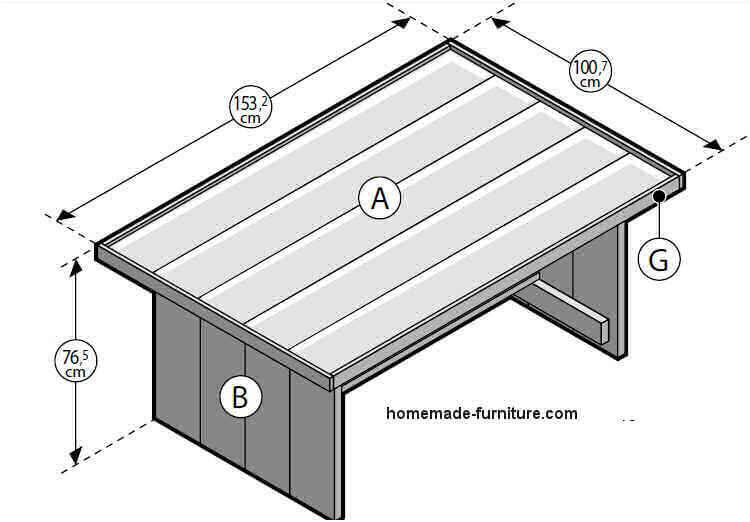 Tables designs plans and drawings, free instructions how to make a table. DIY examples how to make tables from recycled materials. First of all, we think that our drawings are amongst the easiest constructions plans for furniture. Learn how to make tables and desks. Use scaffolding planks and pallets. Do it yourself plans and instructions for free. Illustrated with easy to understand drawings. Most noteworthy, our table designs can be used for inside and outside. In addition we have free plans for garden furniture and picnictables. Homemade furniture with easy assembly methods. You do not need any skills or expensive tools. 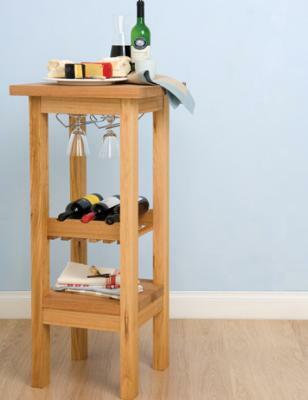 Learn how to make furniture with our woodworking plans. And most noteworthy, all of these free table designs are for easy assembly. 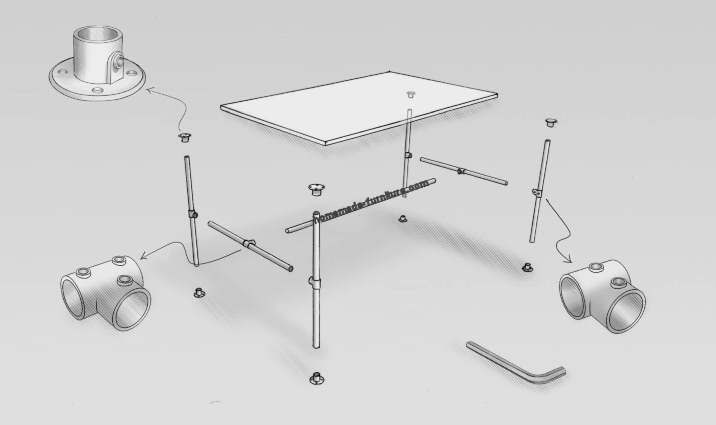 You will mostly assemble the furniture with selftapping screws. 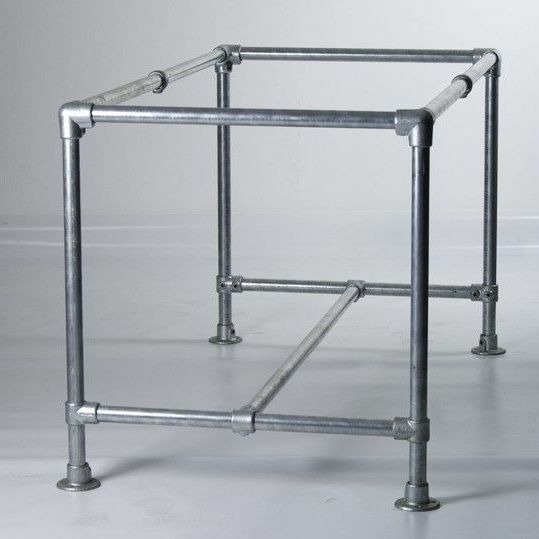 You will probably only need an allen key and a saw for our tables made with scaffolding tubes . However, for a speedy construction we almost always recommend the use of powertools. Specially if you make the furniture completely from wooden planks. Very handy are a power screwdriver and electric woodsaw. Repurposed materials for construction of homemade tables. Try to use repurposed planks and recycled slats to make these table designs. In addition, have a look at the chairs and benches to accompany these furniture designs. We concentrate our construction plans to be especially relevant for recycled materials. Therefore repurposed scaffolding planks are our main materials to make these furniture designs. 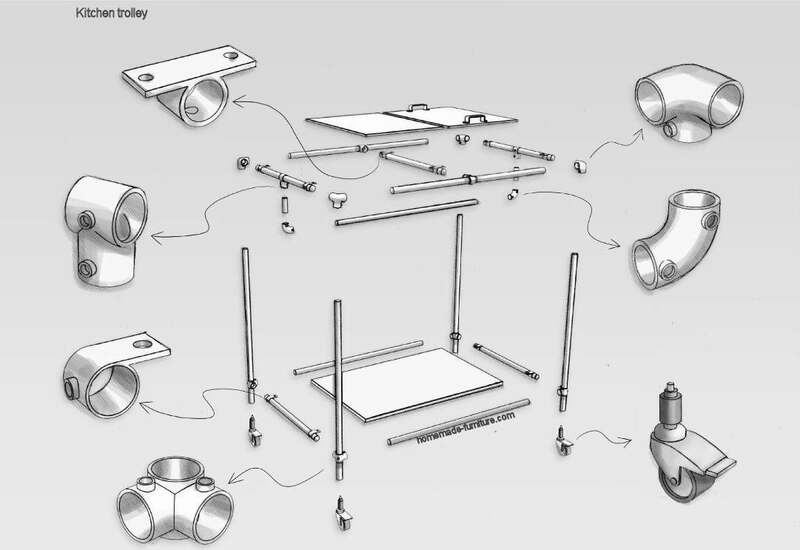 Picnic table construction plans and drawings for an A – frame. 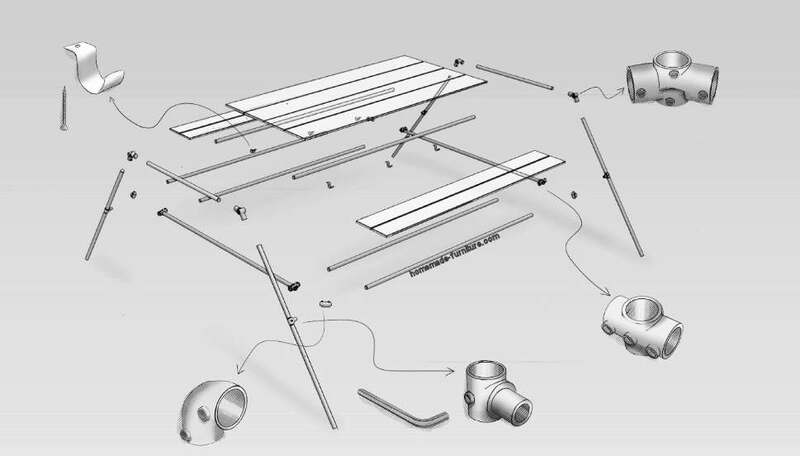 A – Frame picnic table construction drawings and assembly methods. 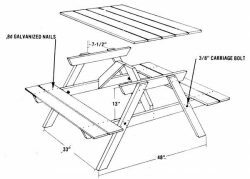 A Frame picnic table model. See how you can make your own garden furniture. We show you some examples for easy tables and benches for outdoors. A table design that is based on the shape of a capital A. This is a strong structure which provides strength lengthwise as well as towards the sides. 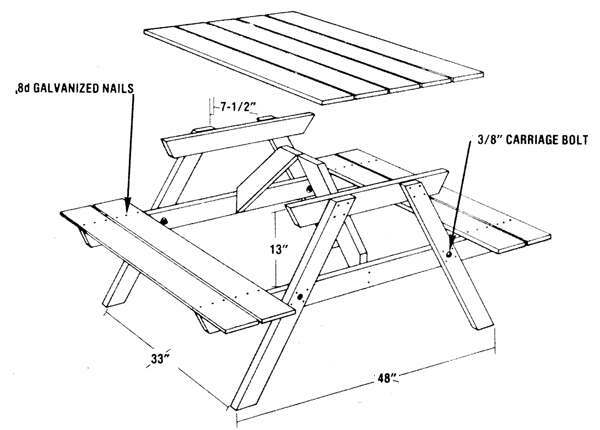 These A – Frame picnic table construction plans have almost always benches integrated in the design. Those benches rest on a horizontal support which connects the table legs. You will need a bit more timber to make the tables compared to the picnictable with crossed legs. Picnic table with crossed legs. 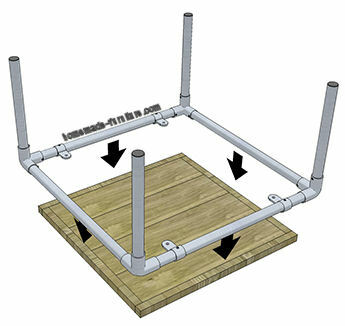 How to make a simple picnic table with X frame support. X frame legs for a picnic table. 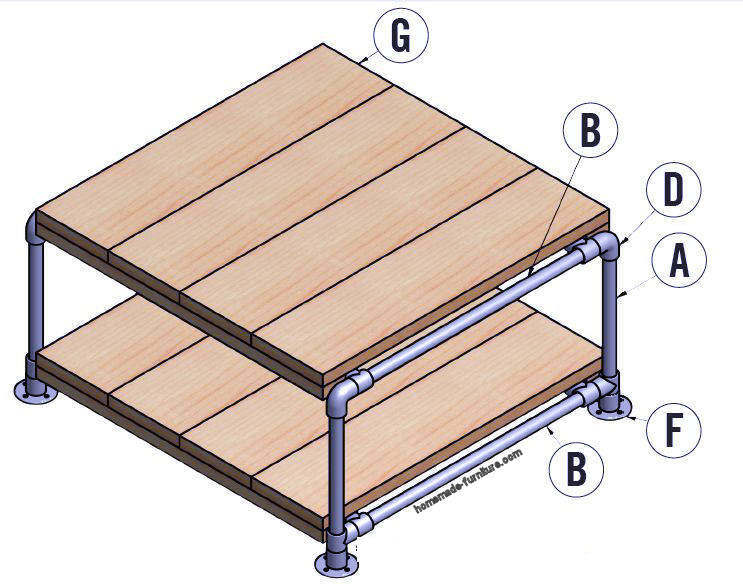 This is a very strong method for assembly of a picnic table. There is no need for complicated joinery. 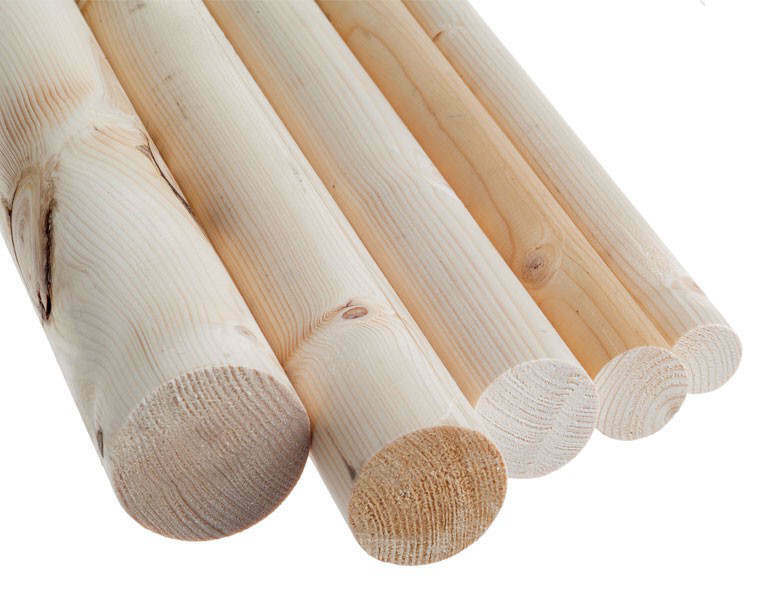 You will nevertheless have to make one important wood joint. That is the lap joint where the table legs cross each other. But no fear, it is really simple to make this joinery method strong and good looking. Neither does it take long, if you start off with a table saw or circular saw. It might take a bit longer if you use a hand saw. 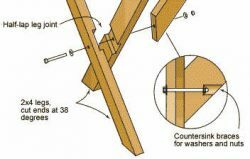 Your result with a hand saw will not be as good as when you use electrical saws. The reason for this is, that table saws and handheld circular saws have a setting for the depth. That makes it a lot easier to chisel the wood away at the same depth. As a result the joint provides a much smoother and flush point of contact. Picnic tables to make yourself, diy instructions and examples. How to make picnic tables and benches for in the garden. 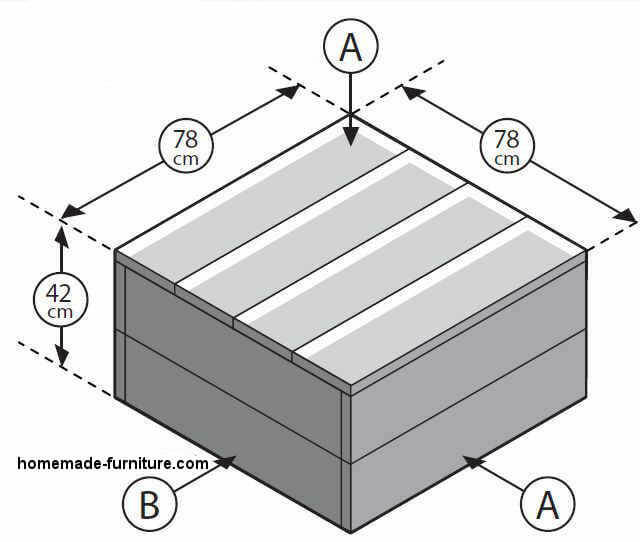 Many of these diy instructions are a translation from our Dutch website for home made furniture. 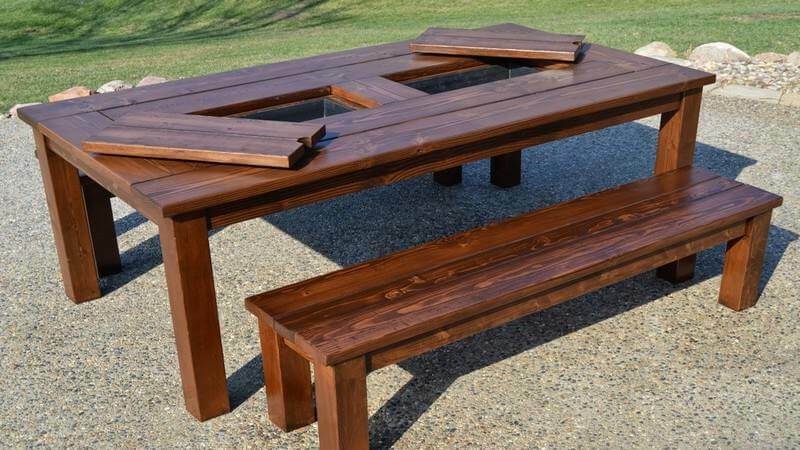 However, there are many other great sites that show you how to make picnic tables and wooden garden furniture. 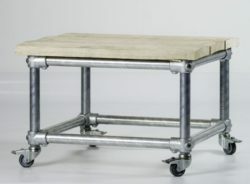 For that reason we will show you some of the best sites with examples how to make picnictables. 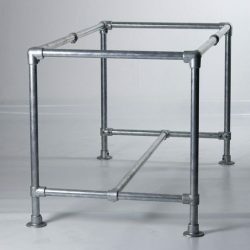 Tube table construction drawings and how to build furniture with repurposed scaffold materials. How to make a table from tubes and reclaimed scaffold boards. Easy do it yourself instructions to make furniture from old scaffolds. A tube table is strong and long lasting. All parts of the scaffolding furniture can be repurposed again. Even though the tubes and planks can often be obtained for free, the tube connectors aren’t cheap. Farmhouse table made from scaffolding boards. Construction drawings for a homemade farmhouse table. 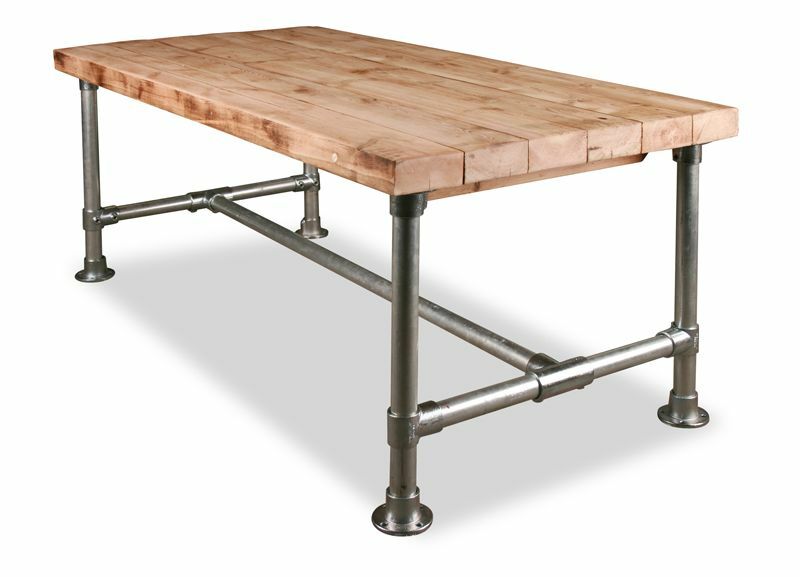 Free plans to construct tables from reclaimed wood. This table design is easy to make, even if you have never made furniture before. The materials for farmhouse tables are cheap and sometimes free. Reclaimed planks from scaffolding and free wood from pallets are ideal for this construction drawing. Planter table with vegetation growing in the tabletop. Examples of original garden tables made from reclaimed wood. Probably you have already seen some of our woodworking plans to make a wooden planter. On this page we show you a few examples of planters integrated in a tabletop. 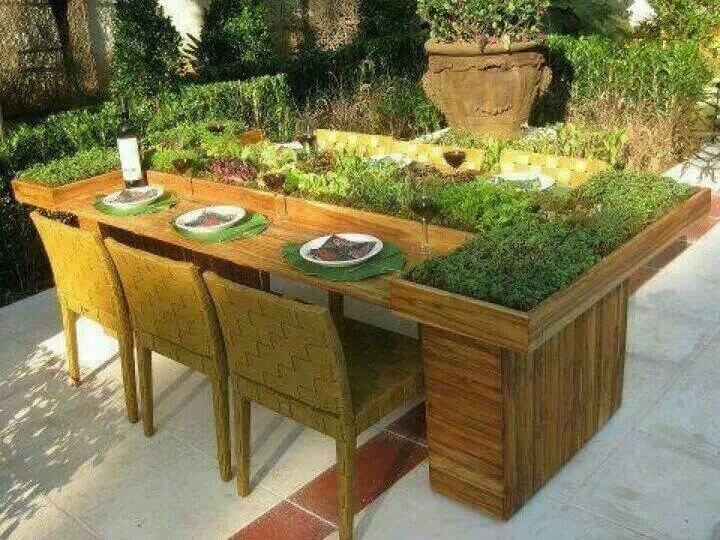 See some great examples to make garden tables. The examples on this page feature an embedded planter in the tabletop. Wall mounted desk construction example. Space saving office desk made of scaffolding wood. Only a few planks are needed to make a spacious desk which does not occupy a lot or room. 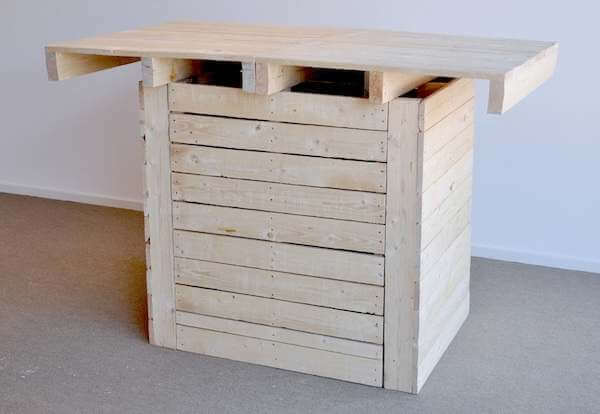 Make this desk from scaffolding planks or reclaimed wood. Since you will be working at this desk you will have to sand the surface to a very smooth texture. Free woodworking examples and plans how to make a low lounge table. 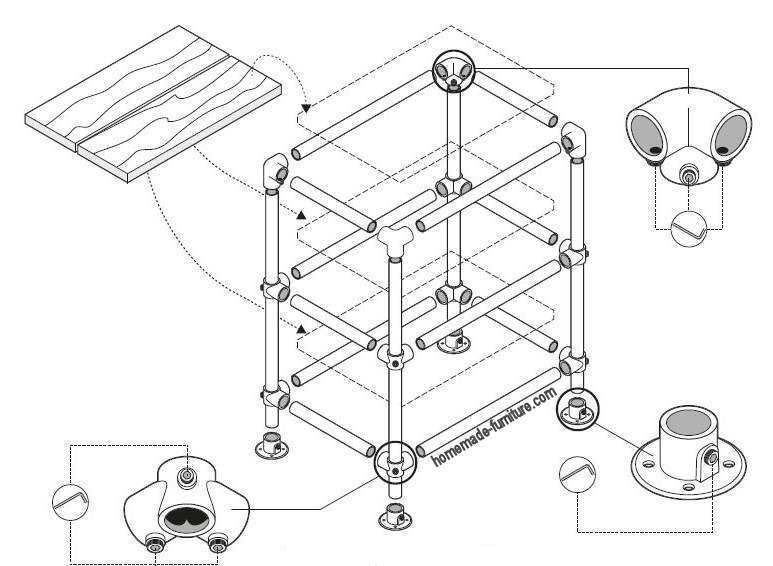 First of all, this scaffold wood lounge furniture is probably the easiest set of woodworking plans. 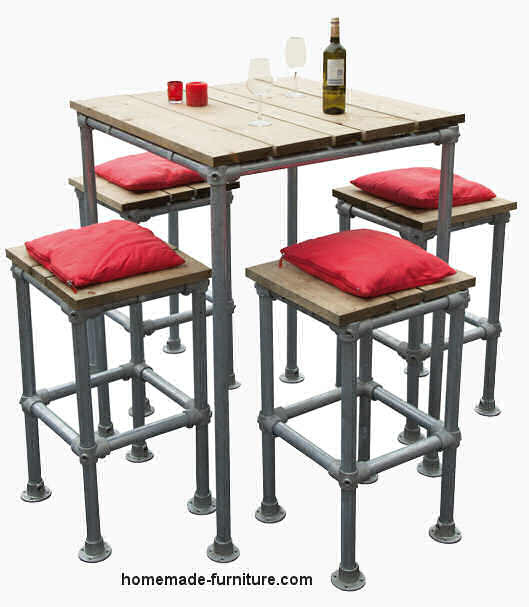 Make your own tables, construct wooden benches and chairs from scaffolding planks. This wooden lounge table is part of a three piece furniture set. 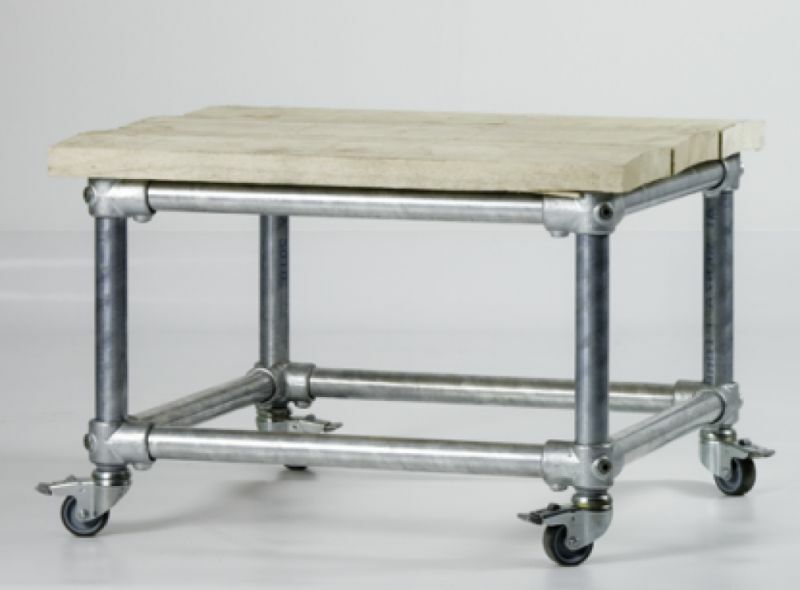 Good weather treatment makes these tables suitable for inside as well as outside. A woodsaw and an electric screwdriver are all that you will need for the construction of a sturdy homemade lounge set.